I have long been fascinated with these so-called haystack cookies that incorporate crunchy chow mein noodles. This was my first attempt at making them. I was going to use only semisweet chocolate, but I was told by several people that butterscotch chips are NOT optional, so I went half butterscotch chips and half semisweet chips. I think the butterscotch chips are a bit too sweet, really, so next time I think I will go 70/30 or use all semisweet. I also threw in some roasted peanuts, which holy crap are so delicious straight out of the can, but in the haystacks you can’t really even taste them. Maybe I will go with a different type of peanut next time? Anyway, still a crowd pleaser and still delicious, and still super easy peasy. In a heavy, large saucepan, slowly and gently melt the chips over low heat, stirring frequently so you don’t burn the chocolate. When it’s melted, remove the pan from the heat and toss in the noodles and peanuts. Mix together then spoon little clumps onto a waxed paper-lined baking sheet. Let cool or throw in the fridge to speed the process along. They look good! I use the noodles to make little nests at Easter (http://floatingworld.typepad.com/floating_world_views/2008/03/chocolate-easte.html) but I’ve never used butterscotch chips… I’ll try that next year. Oh, and peanut butter stirred through is really great! I haven’t ever made these so it’s not like I would know, but aren’t they supposed to have mini marshmallows in them? And raisins maybe, too? Although as far as I am concerned the raisins would make them gacky. When I’ve made those, I used pecans for the nuts. Haven’t ever made them with peanuts. I have to say that any sweet that doesn’t involve the oven (which is already being overworked) is aOK in my book! When we make haystacks (which is a non-optional holiday activity at this point), I use a cup of broken-up pretzel sticks and a cup of roasted peanuts to 1 lb. melted chocolate — and I do a batch each (at least) of dark or semisweet chocolate and of white “chocolate”. My husband considers these the perfect dessert. It’s hard to argue with requests for them, since they are so EASY to make! I’ll have to try the noodle-for-pretzel substitution, though. I bet he’d love those. I will echo, the butterscotch is NOT optional. Sure, cut the ratio down, but getting rid of them would be doom. Doom! i don’t think we can buy the crunchy noodles here in Japan, but i like the pretzel idea…. and mixing up white or dark chocolate… and adding any kind of nuts…. maybe they need a new name, like …”anything goes in the haystack”….or “a roll in the haystack, anything goes…” ” or “everything but the kitchen sink in the haystack”…..
ha ha ha.. merry christmas mariko!!! For me the butterscotch chips are NOT optional and I use salted sunflower nuts as my nut addition. Yum, one of my favorites. I make these every year at the holidays and they are always a big hit! I use less butterscotch chips… like one bag semi, 1/2 bag butterscotch. 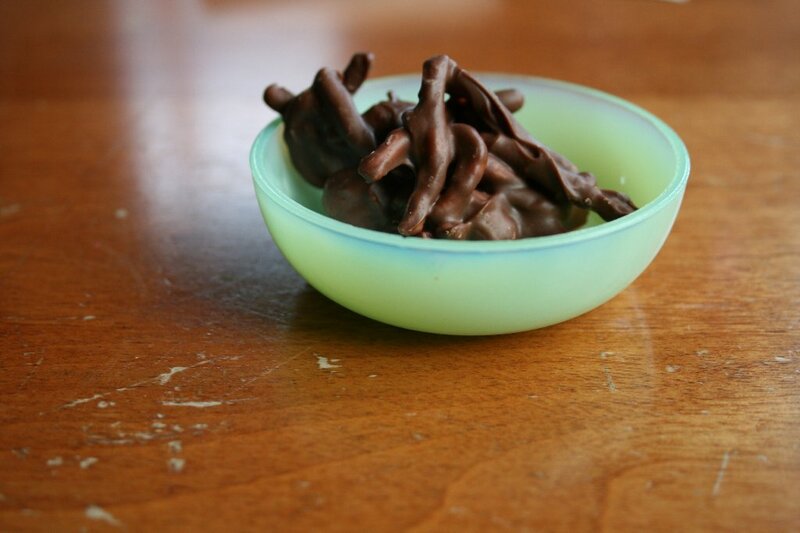 I also try to stretch out the recipe and use as much noodles as I can w/o skimping on the chocolate. So easy and quick to make. i used to eat ramen noodles raw from the package as a kid. they were our version of chips. but covered in chocolate/butterscotch, i’m not so sure.